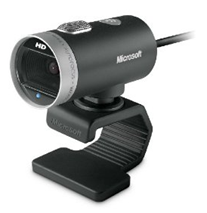 I've owned just about every Microsoft LifeCam there Microsoft makes. My first was the LifeCam NX-6000 and I've been upgrading ever since. I have been using a VX-7000 for the last year and it's a fine webcam. Best I've used, really, until now. 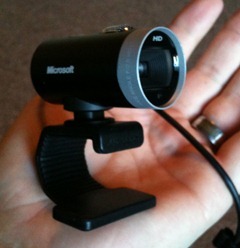 I just picked up a LifeCam Cinema HD on Interwebs for ~US$60. First, a quick disclaimer. While I work for Microsoft, I don't know anyone in this group and in this instance, I'm just a dude with a credit card and a camera. Any speculation here is mine and any mistakes are mine. Ok, this is a really tiny camera. I think it was the barrel-shape of the glass lens mounted on the base but I pictured this thing as huge. It's not. It's petite. It feels nice as well. It feels well engineered, not cheap. 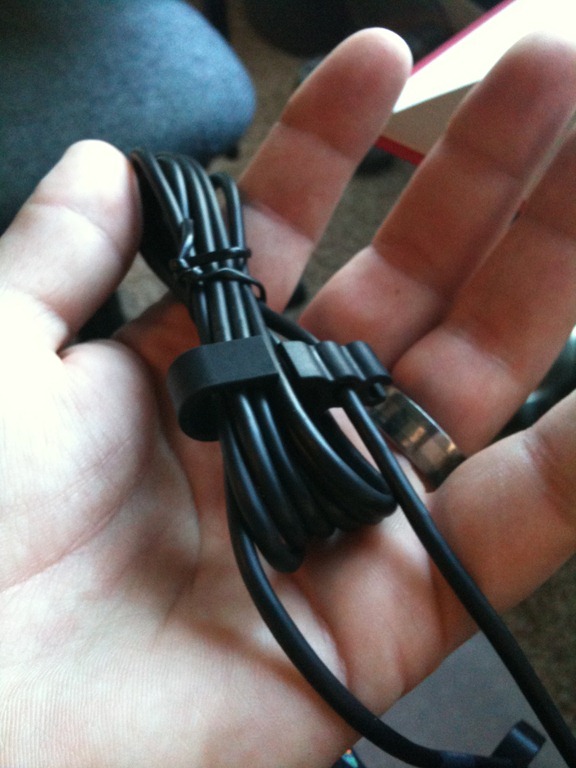 It also has a nice little feat of engineering on the USB cable - a cable tie that actually works! Miracle of miracles. The VX-7000 has a 2.0 Megapixel Sensor with a maximum video size of 640x480. I called my friend using Office Communicator and did a standard video call and had him take a screenshot. The cameras were mounted next to each other. 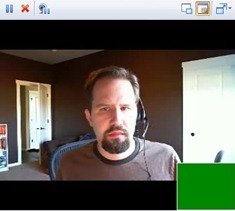 The older webcam is on the left and the newer Cinema HD is on the right. Default settings were used with both cameras. Both calls are effectively 640x480 calls as there's no built-in 1280x720p HD in Office Communicator (yet, I assume.) However, it's clear that the contrast of the Cinema HD is far superior and oddly, it's just clearer. People have said they feel like it's HD, even though it's not in this example. This camera is fantastic in low light. It's a 16:9 camera, and it has a nice wide field of view. Notice you can see my closet in the picture at right. Here's a HiDef Video of the LifeCam Cinema HD. You can visit the Vimeo site directly and download the WMV if you want to get the REALLY high def file. Here's the older 640x480 LifeCam VX-7000 as a comparison. You really need a fast machine at the higher resolutions, like true 720p HD. This is to be expected, but if you're doing to record 1280x720p you're going to need a multi-core machine (basically a machine that's newer than 3 years old). That doesn't make the camera useless for regular video calls, but it is something to think about if you're getting this primarily for its HD abilities. That said, it's still fantastic at 480p and my laptop handles it fine. I suspect that this camera will just get better as software comes out to really utilize its abilities. 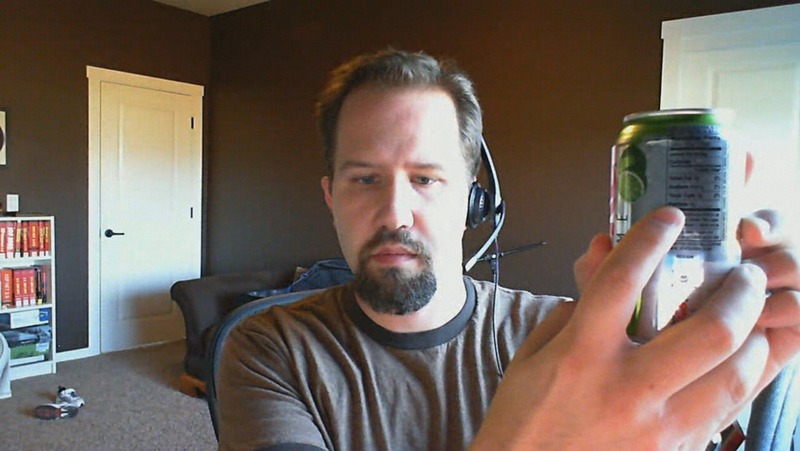 It's a webcam, so it works in any Webcam enabled applications, but as for the higher resolutions, it's a bit tricky. 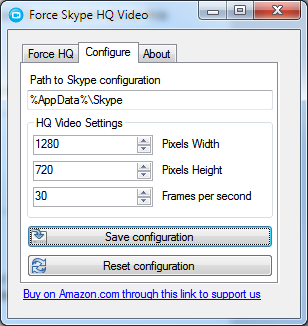 There's no checkbox inside Skype or any formal "we support HQ or HD and here's how." The same is true, so far, for Windows Live Messenger. People need great cameras for quality images, great bandwidth to pump the frames and fast computers to compress the outgoing video. If any one of these things doesn't work out then everyone loses, so I suspect it's easier for now to punt and wait. However, I'm convinced that HD video chat is coming. I'll dig in and report back. 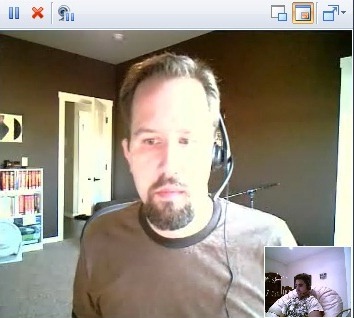 Skype has been very quiet about what they call HQ Video calls, basically 640x480. For a while there was a thing called the HQ Video Hack which consisted of opening up a config file and forcing it to 640x480. There's even an 3rd party application (with source) that says it'll modify the Skype config file and enable HQ Video for you. In tests between Jeff and I we found that while we GREATLY prefer the 16:9 widescreen experience, that the difference in real clarity between 4:3 800x600 and 16:9 1280x720 was minimal, but the lag between audio and video for the true HD resolutions was at least a half second. This was so irritating as to be intolerable. We found through experimentation that a 16:9 resolution of 960x544 was ideal. It gave us a buttery smooth frame-rate with the benefits of the widescreen aspect ratio and wider field of view. This worked great with Skype. Here's some imagery of our tests. Note, these were all screenshots taken on Jeff's remote machine with video sent from my machine. Here's the same calls with the advanced Technical Info turned on showing the resolutions of each call . I tried also with Windows Live Messenger, and cool enough it didn't require any hacks or funny business to get 640x480. As soon as I switched into Full Screen while taking to Brad Wilson there was a "You are now watching High Quality Video" overlay in the corner and everything just "got clear." So, Live Messenger is setup for 640x480 out of the box already. I haven't figured out how to hack 720p HD support into Live Messenger like I did into Skype. I can only assume they'll enable 1280x720 at some point in the future. This is speculation, but it'd be a pretty obvious thing to do. Here's a 640x480 call in Full Screen mode in the current version of Windows Live Messenger. Apparently I chew on my tongue a lot. While the software vendors aren't officially ready for a true Hi-Def video call and it'll likely require Quad-Proc PCs on both sides, it's coming, and this is the camera to use. Until that day, I'll still be rocking DVD quality 480p video calls. Honestly. A 1280x720p Hi-Def WebCam for US$60? Seriously. Really. You know what you're getting for Christmas from me. Until The Next Big Thing comes along, there ARE no other webcams. I wish that that you'd posted this a week ago! Last week I purchased a Logitech Quick Cam Pro 9000, because I couldn't find any other alternatives to provide high-resolution support on Skype (sometimes Google is not your friend - it's hard to find answers to the simplest questions). 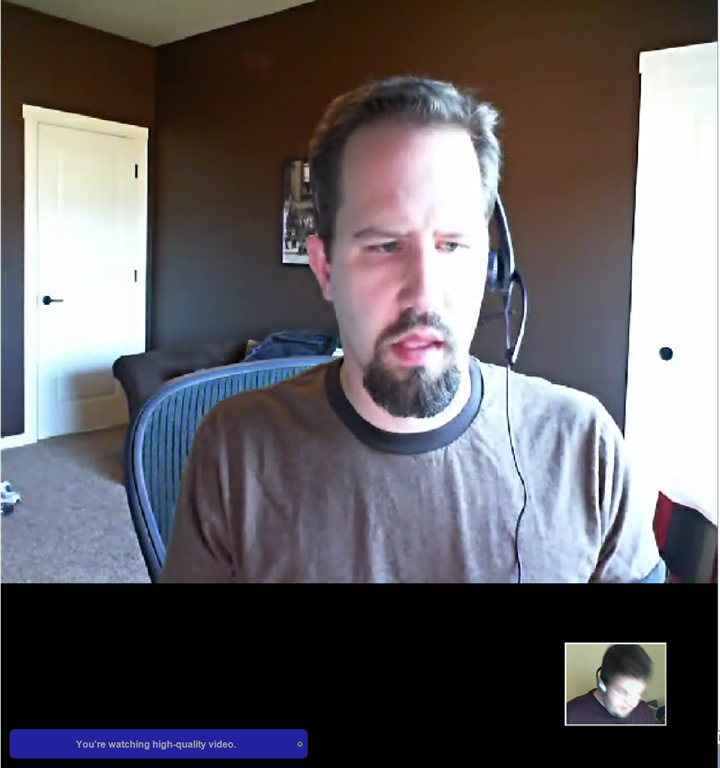 The whole high-resolution thing on Skype is very poorly documented. Here in New Zealand if you go to the Skype online shop, they don't even list any WebCams that you can purchase with high-resolution support. Of course as you're aware from your visit here the broadband is so poor, it may not really matter! :-) My WebCam cost me around $105US, so you got a much better deal. Nice. Purchased. Will arrive Saturday; thank you Amazon Prime. As an added bonus, +$2.40 for fighting Diabetes! Portman - Woot! Yes, thanks for the $2.40! Me thinks you need a better looking model. I believe there is a limit to the amount of pictures you can post of yourself in one blogpost ;-). Or were you trying to break a record? The phenomenon of the HD setup looking better despite not actually being transmitted as HD is pretty common, especially down at the low end of the quality scale. A webcam is never going to have optics or electronics that push to the very upper limit of the quality you can get with the resolution available, and so the picture is likely to be below par for whatever resolution you have. But for an HD one to be worth anything, they need to have raised the game at least to the point where you can tell the difference between that and the non-HD one. So it'll look better than an SD webcam, even though it might be no better than a really good camera could be with the SD resolution. You even see this in professional productions. Content produced for HD tends to look better at SD than content produced for SD. SD video is actually capable of better quality than most people think - given a high bitrate, competently encoded SD version of HD content, most people are hard-pressed to notice that it's not actually HD, unless it happens to be the sort of scene shown on HD demos that deliberately highlight the differences. The main reason most SD broadcast video looks poor compared to HD is due to a low quality broadcast configuration that makes SD look much worse than it really needs to. I'm getting a webcam for christmas from the Hanselman? You made a good point when you said "unless someone starts using the video card to do it". Does anybody have an educated guess on why they're not doing that? It seems like that would be ideal. Is there some technical reason to not do that? When all is said and done, I would guess very few care about HD, but lots care about convenience, easy of use, and mostly just having it right there with 0% work. the same in Greece dude! I found the camera for 66 or 79 euros. According to google currency convertion that is 97 and 116 USD. Is this stealing or Google has a problem in currency convertion!? Great comments as I am just about to return the VX-7000. For some reason the software would not work. It didn't recognize that the camera was connected to the computer - the camera did work independently with Skype. I contacted tech support at Microsoft and was pushed up the ladder to the "team" that has been dealing with the software issue. According to the tech this is a widespread problem even with the LifeCam 3.0 version, which we downloaded. Bottom line is that they told me to return it. The tech guy actually suggested I look at Logitech - so do you recommend the Microsoft Cinema over the Logitech QuickCam Pro 9000? If you are using a Quad Core Microsoft Office Communicator will do 720P with that camera.. I think I'm about to buy one right now, thanks for the excellent review. In the first dual picture you say the newer camera has a wider angle, but although we can see your closet on the right, we can't fully see your bookshelf on the left, like on the other camera. They were pointing at different angles which makes the comparison hard. Great post! I am very disappointed, that neither skype not MSN has REAL(!) HD support. The usual marketing b***sh*t. A big "F" for skype, they promote HD and high quality all over their website as long as I really want to find out how it works. Since that point, no info at all. As soon as I grab a quad core server machine, I will test OCS R2. What did you use to capture the HD video uploaded to Vimeo? On the Vimeo site there is only a mp4 version 1280x720@15fps! Nice post! I just got a MS LifeCam Cinema HD and have been trying all morning to make Skype do 1024x720 video calls without any success. I've tried many different resolutions with no luck. It seems like the highest Skype will send out is 640x480. Can you tell me how you got yours to work at higher res? Thanks! I had to use Skype version 4.1.0.166 to get it to work on my machine. The latest versions of Skype (as of now, 4.1.0.179 and 4.2Beta) didn't work for me. Receiving end of the call is freezing on their side so just have to figure that out. Using 800x448 and will try 25fps instead. Also had to apply settings from Force HQ when Skype is not running. I am thinking of using this little jewel for astrophotography. The barrel shape is perfect for adaptation to a focuser. In order to stack frames in Registrax, I need AVI output. Is this possible? Also, does the software allow manual focusing? Another possibility is to remove the lens and focus directly on the sensor. Do you think this would be possible? great review! question i had; in comparison of other models- what's the still image megapixel like? 2.0? greater than 2.0? I've been comparing the Lifecam HD and the logitech quickcam vision pro. which both tout 720p HD. But the logitech repeatedly talks about i having a 2 megapixel sensor "Featuring Carl Zeiss optics, the Logitech® 960-000254 delivers vivid detail and clarity with a premium quality 2 megapixel (MP) image sensor." does the lifecam HD have the same kind of specs? What about the frame rate? Does windows live messenger support the same frame rate as Skype HQ? 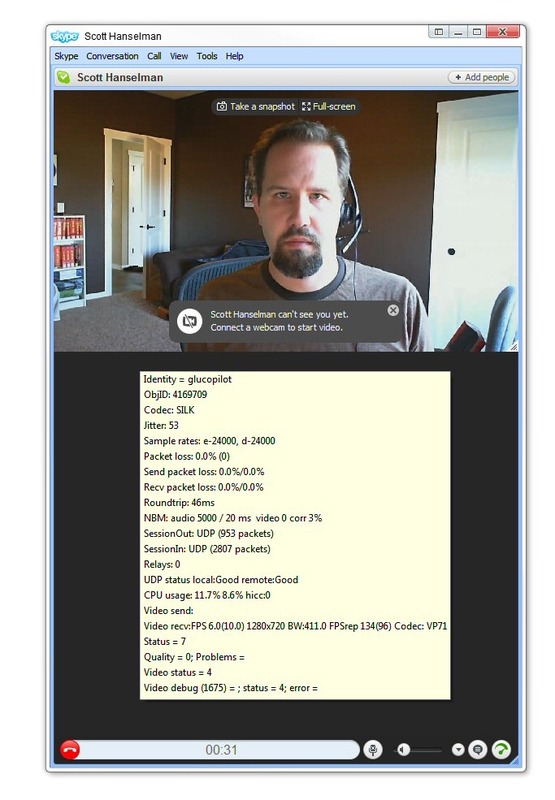 Frame Rate: I can't tell as the camera software doesn't expose it, but Skype technical details imply 15fps. When I make videos using their internal software I'm getting 15fps also. I haven't figured out if this is a limitation of my machine (slow?) or the camera. Megapixels: Still captutres are 2880x1620 or about 4.5 megapixels. They aren't very clear so don't think this is a still camera. It's average. 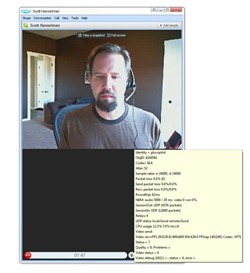 AVI Output: The built-in software makes WMVs, but you can certainly get 3rd party webcam software and make AVIs. SkypeHD: They appear to be trying to prevent us from doing this hack. Sometimes it works, sometimes not. I know that the Microsoft LifeCam folks are trying to get it to work on as many apps as possible, but it appears from my perspective that this is a Skype problem (maybe political?) not a hardware issue. Vimeo: I used the built in software to make a WMV that I uploaded directly to Vimeo. Where did you get the Livecam Digital at $60 from who is Interweb? can't find them, do you have a link? Thanx for the hint about Skype hack man! Thanx for the hint about Skype hack Scott! Hi Scott, thanks for the review. I've got one of these puppies in the post (I'd already purchased before seeing your review). Could you tell me what the audio is like? Would it be clear enough to run say voice recognition? My current webcam (A Logitech QuickCam) only has 1 channel 16000 Hz tape recorder quality sound and is no where near good enough. I can't find a specification for this cam's audio anywhere. Would also be interested to know what your audio solution is for web conferencing. From the pictures it looks like you use a separate headset rather than relying on the built-in mic. I bought this camera, thinking "FINALLY, I'll be able to do some decent guitar videos". The Video quality is BRILLIANT, don't get me wrong. The colours and everything are fine (I'd rather a warm orange/brown than a whitewash blue hue, due to the little white desktop light next to my computer) but if you want to record video with this camera, the audio mic built into it is atrocious. It's apparently a digital mic capable of recording quality like the Blue Microphone's Snowflake, but I would say definitely not. You can use a different microphone in skype/msn video calls, but video recording with the lifecam cinema MAKES you use it's inbuilt mic, which you can hear the little staticy zooming/beeping sounds. In his video comparison of the Cinema, you can hear it, only slightly. 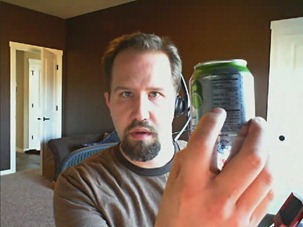 The audio is being taken in by the mic on the webcam, not on the headset as it may seem. I'm quite unhappy with the audio quality recording. I'm going to take this webcam back for now, and wait until they have one that has a decent mic in it. Why not use a free webcam recorder or Expression Encoder to record your video from one source and audio from another? You are describing a limitation of the in-built software, not the camera. Okay, that works, but I'm still quite disappointed that the cinema's 'crystal clear' audio experience is everything but. It was a limitation of the software, but the fact that I choose to use another microphone because of the webcam's poor quality one is a hardware issue. For those who will encounter the same problem, NCH's debut video capture does quite well.